Only IPU CET qualified candidates can participate in the IPU Counselling Procedure. Candidates can check their IPU CET Result to know the qualification status. Candidate has to deposit one time (non refundable) counselling participation fee, as per schedule for each CET code. 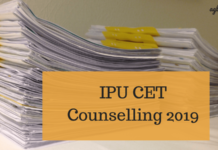 On this page you will get information regarding IPU CET Counselling 2019 Participating Fee, Registration and Choice Filling. Candidate have to register online only after paying Counselling Participating Fee within the registration period. In case payment of fee is made through challan, candidate can register only after two working days of cash deposit. For registration, candidate need to enter CET details in IPU admission website or link given below. After authentication, the candidate has to enter his / her personal, academic, contact details. During the registration process, the candidate will get login ID and password. Registration: The Registration of IPU 2019 Online Counselling will be available at the official website www.ipu.ac.in. Note: Few candidates have informed that they are facing problem regarding submission of counselling participation fee of Rs 1000/- through Net Banking/Credit Card/Debit Card through their accounts show transactions but not able to generate the receipt. The reason may be a failure of transaction/Payment not being credited to University Account etc. All candidates are hereby informed that in such a situation as the amount not credited to the university account and on transaction failure the reversal in the respective accounts may take 2-3 working days. The University has brought the issue into the knowledge of service provided to look into the same to mitigate the inconvenience to the candidates. Editing Registration Details: Candidate can amend / edit the registration details filled in the registration form by choosing “Edit Details” option form the menu with in the specified period of registration. Candidates must take two print outs of the Registration Form. One must be submitted at the time of Document Verification and other to retained by the candidate for all future reference. Candidates has to deposit a non-refundable charges as applicable, as one time Counselling Participation Fee. For depositing the Counselling Participation Fee, the candidate has to visit the GGSIP University admission website www.ipuadmissions.nic.in and select the option for “payment of counselling participation fee” or directly visit the link given above. To make payment candidate need to enter CET details viz CET Roll No, Date of Birth and Mobile Number. Net Banking / Credit Card and Debit Card. The candidates are required to check the status of fee payment on the website and must take the printout of online fee confirmation receipt with the transaction details, to be retained for all future reference. In case of payment of fee through Challan, the candidate must retain the copy of the Challan after depositing the fees. If the fee is paid through credit I debit card and status is not ‘OK’ it means the transaction got cancelled and the amount will be refunded to concerned credit I debit card. Such candidates have to pay the fee once again. In case of any problem regarding payment of fees, non availability of fee confirmation receipt on the website within the specified time, candidate can contact Help desk of University to resolve the issue. Choice filling is compulsory for allotment of seat. Candidate will not be considered for online allotment of seat without the filled in choices / preferences. After registration, candidates has to fill choices for allotment, from the list of all possible combinations of all institutes and courses available, in the order of his / her preference, during the choice filling period. Once the period for filling of choices / preferences is over, choices / preferences filled by candidates will be used for allotment of seat. For the benefit of the candidates, the stream-wise and institute-wise and rank-wise Admission Rank cut off data is available on HERE. Candidates, however, will be given the opportunity to edit preferences after allotment of seat in Round 01 for the subsequent round of counselling. From previous experiences, it has been noted that some candidates fill up very few number of choices, may result in non allotment of seat during seat allotment. Therefore it is once again advised that the candidates should fill as many choices as possible to ensure that they have better chances of allotment of seat.